"Diane J. Comber, Westbrook College, Class of 1976"
Westbrook College student Diane J. Comber, Class of 1976, was a General Studies/Science major and a Day Hop. 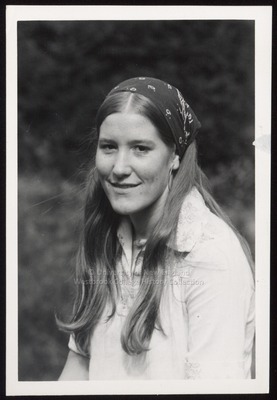 For her senior class candid photo, which appeared in the 1976 Tower Yearbook, she wore a light colored shirt and a bandana babushka with large loop earrings. Her hair was long, parted in the middle and partially pulled back by the bandana kerchief.